Above all of these, her greatest possession was her ability to demonstrate compassion, caring, and kindness for those with whom she came in contact. Abby was the girl who stood up for you on the school bus when you could not stand up for yourself. She was the kind stranger who took you by the hand and introduced you to your classmates when you were the new student. She encouraged you to pursue your hopes and dreams. Her eyes, smile, and infectious giggle helped to brighten your day. But what Abby did not possess was experience behind the wheel of a car. Late one evening, a deer, standing in the middle of a dark highway caused her to swerve and lose control of her vehicle, and subsequently she lost her life. The goal of The Abigale Miller Foundation is to enhance teen-driving education programs. It is our vision that Unionville High School and other high schools around the country will be able to instruct new drivers, through the use of driving simulators, on how to avoid and properly react to the many hazards we encounter daily on roads and highways. The Abby Miller Foundation aims to SAVE THE LIVES OF TEENS by improving driver’s education. Your donations can help make this dream a reality. Her eyes, smile, and infectious giggle helped to brighten your day. Abby Miller had everything that a 17 year old girl could possibly hope to possess. She was intelligent, beautiful, witty and charming, athletic, and loved by her family and friends. My name is Brian Miller, I am writing this article to increase awareness about a life or death topic affecting almost all of us; and hopefully prevent what happened to me and my family from happening to yours. The life or death topic I am referring to is teen driving safety. •6,500 teenagers lose their lives behind the wheel every year I the U.S.
•Teens no longer have to face the state trooper to prove they should be behind the wheel of an automobile….That’s right. Driving tests are no longer required to get your license! •Drivers Education is an after school program for those who choose to attend. Friends, I’m sharing these statistics with you because on June 13, 2008, my beautiful daughter Abby did not have the driving experience she needed at age 17. Late one evening, after school had let out for the summer, a deer, standing in the middle of a dark highway caused her to swerve and lose control of the new vehicle I had just purchased for her. Subsequently, we lost her that night. In Abby’s memory, I have founded The Abby Miller Foundation (a nonprofit corporation). Our goal is to enhance driving education programs by helping high schools, around the country, have the ability to instruct new driver’s though the use of driving simulators. These simulators will help teach our kids how to react and properly avoid all the hazards that we face on our roads daily. Out of all the teenagers that lose their lives in car accidents each year, 76% of those are due to inexperience. Through out the year we have multiple fundraising event to raise funds to purchase driving simulators, Raise awareness, Change laws and build scholarships. As of today, a little more than one year since Abby passed, we have raised enough money to purchase six driving simulators at a cost of $13,000 each. We are also raising funds to lobby local, state, and federal government to put Driver’s Education back into our schools as part of the daily curriculum. 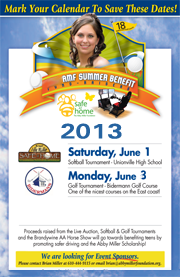 Information about fundraising events can be found on line at abbymillerfoundation.org.